Posted on July 5, 2018 by Hillary T.
When it comes to summer rituals, watching fireflies light up the night sky has to be one of the most magical. For generations, these flying insects have been providing wondrous moments for people of all ages. 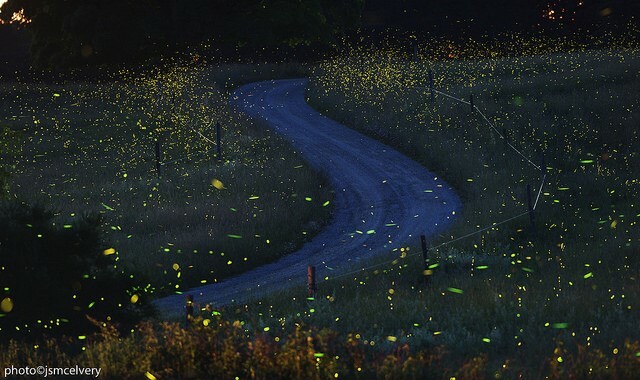 Lately, though, scientists are curious if firefly populations are growing or shrinking. And in order to get those answers, they need your help. This citizen science project asks people all across the country to report whether or not you see flashing fireflies. The Museum of Science in Boston launched this project 10 years ago. This year, Mass Audubon is carrying the torch (or should we say flash), and we have partnered up with the preeminent firefly researchers from Tufts University (shout out to Sara and Avalon!). All you need to do is go outside after dark, take stock of your surroundings, and then set a timer. Each observation includes three 10-second time periods. 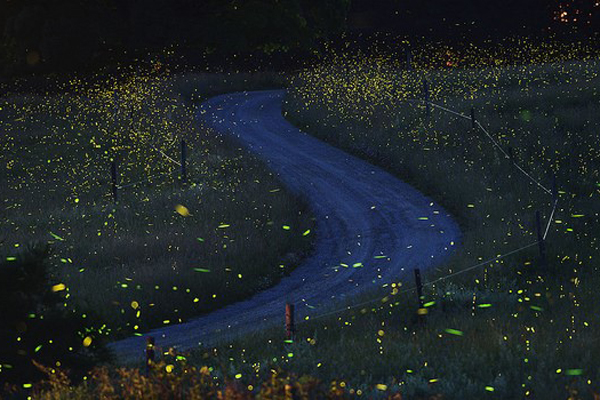 If you see fireflies, sweet! Let us know approximately how many. Didn’t see any? That’s ok! We still want to know that too! The first thing to know about fireflies is that even though they’re often called lightening bugs, they are not a bug (nor are they a fly). Rather they are beetles that have this really cool ability to light up their lower abdomen (the bottom part of their body). Some of them light up in a specific blinking pattern, like a secret code that they use to “talk” with other fireflies and to find mates. In North America, there are over 150 species. Flashing fireflies (note: not all fireflies flash) fall into three main groups of flashing fireflies: Photinus, Pyractomena, and Photuris. On first glance, they aren’t easy to tell apart, but the different species have different flash patterns. Before heading out, check out this handy chart. 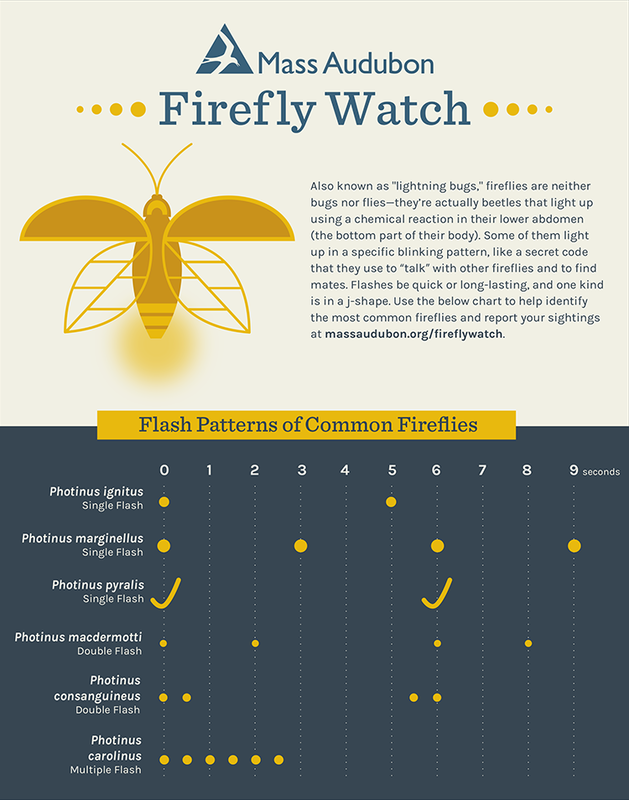 Ready to be a Firefly Watcher? You can head out on your own or join an upcoming program or event. Find a list of what’s planned, see a map of current observations, and submit your own sightings at massaudubon.org/fireflywatch. This entry was posted in Get Involved and tagged citizen science, fireflies, firefly watch on July 5, 2018 by Hillary T..